Model T Ford Forum: Early T-511 Exhaust Manifold Interesting Flanged/Flared Variation This one shouldnt exist? Early T-511 Exhaust Manifold Interesting Flanged/Flared Variation This one shouldnt exist? Model T Ford Forum: Forum 2018: Early T-511 Exhaust Manifold Interesting Flanged/Flared Variation This one shouldnt exist? So my best find of the day at the Richmond swap meet was this really interesting variation (at least to me) of the T 511 exhaust manifold. From Gails' and Bruces' info, it would seem the T-511 was the type that took the packing. 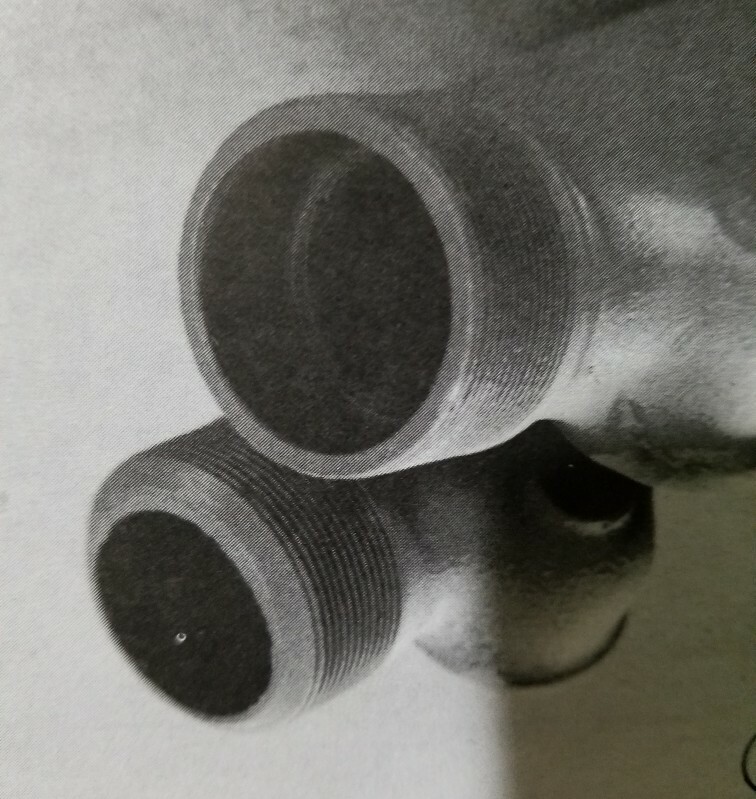 And the later version had the flange area for the flare on the pipe. As well as round core supports. Well, this one I found has all the characteristics of the early packing version T511, down to the waffle core supports. Except it has the flange for a flared exhaust pipe. I guess that begs the question (and one where I have not found a date), is when the change over to the flared pipe happened. So they either changed the mold, or just machined the flange on older unused stock? I havent seen any of the packing versions, so was the bore, machined to size, or cast that way? Regardless, I was needing one of these for my early 13 runabout, so I am ecstatic at finding one! Didnt think that would happen! One question I have, is I have one of Larry Smiths exhaust pipes. But its made for the packing gland style manifold. Id like to use this one because of its uniqueness. How much do I have to trim on the manifold edge to add the flare? Found a pic of the difference between packing and flared versions. I have one of those on both of my '13s. I makes removing the exhaust pipe so much easier, and when bolted up, you can't tell. Sure looks like it has a lot of porosity,wonder if it was one of the last ones to be poured out of a batch of molten iron. Larry, do you have the same type as mine then? With the number T511 on it with the flared end? Because according to Gail, the new number was T483, with the change from packing to flared end. Also the flared end had round core supports, not waffle like ones. So what I want to know is what this abboration of mine is all about. Steve, I noticed that porous nature as well. I was wondering what could account for that other than alot of air or gas bubbles in the molten iron. Otherwise the manifold looks great. Is the porosity not from the coating on the manifold? It looks to have something on it. A very rough finish can create air bubbles like that depending on what coating is used.